Dhaka, 12 October, Abnews: Prime Minister Sheikh Hasina today assured that her government will do everything necessary for further flourishing games and sports in the country, saying that sports and culture give scopes to the people to project the country internationally. “The practice of sports and culture give scopes to the people to project the country internationally. Besides they (people) learn discipline and become self-confident through practicing sports and culture,” she said. The prime minister said this while according a reception to Bangladesh U-16 Women Football Team for becoming group champion in the AFC U-16 Women’s Championship. The reception was hosted at the premier’s official residence at Ganabhaban here this afternoon. The prime minister said the country once lagged behind sports and games and there were many hurdles in this field. “But by the grace of Allah, that hurdles have gone and we’re advancing by overcoming that obstacles and this advancement will continue,” she said. Sheikh Hasina said Bangladesh is now an independent country and it was liberated under the leadership of Father of the Nation Bangabandhu Sheikh Mujibur Rahman. She said the Father of the Nation struggled throughout his life for establishing a developed and prosperous Bangladesh. “Not only as the prime minister, also as a daughter of Bangabandhu, I’ve a responsibility to materialise his dream,” she said. In this connection, the premier said the power to her is a responsibility and serve the people. “The power to me is to materialise Bangabandhu’s dream of establishing a hunger and poverty-free Sonar Bangla,” she said. Sheikh Hasina said once efforts were made to take the country backward. “My sister and I had to lead a refugee life for six years as we were barred from coming home after Bangabandhu’s assassination,” she said. She said after returning home, she visited every area of the country and tried to know the problems of the people. Mentioning her family’s attachment to sports and culture, the prime minister said her grandfather and father used to play football. “All of my family members were involved in sports and games and my eldest brother Sheikh Kamal was the founder of Abahoni Krira Chakra,” she said. 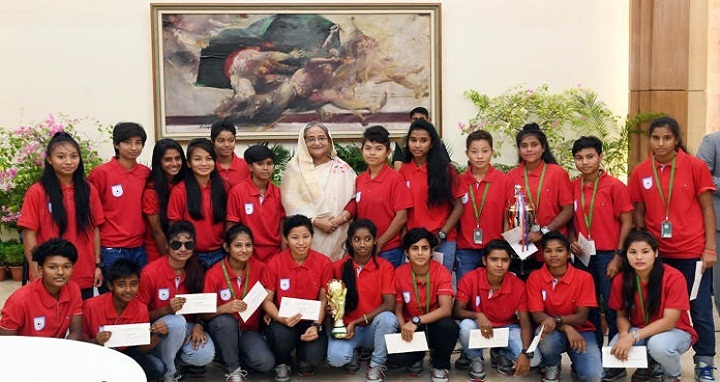 The prime minister congratulated the Bangladesh U-16 Women Football Team and its officials for becoming group champion in the AFC U-16 Women’s Championship. “I hope they will advance and will do better further in future,” she said. Mentioning Bangladesh U-18 girls’ crushing 17-0 goals victory over Pakistan in Bhutan, she said this win seems to her like a victory of the liberation war against Pakistan in 1971. Pointing out the introduction of Bangabandhu and Bangamata School Football for boys and girls, the prime minister said the country is now getting benefits from it. Deputy Minister for Youth and Sports Arif Khan Joy and Bangladesh Football Federation (BFF) President Kazi Salahuddin, Senior Vice-President Abdus Salam Murshedy, MP, Awami League Youth and Sports Secretary Harunur Rashid were present at the function, among others. Earlier, the prime minister handed over some gifts to the members of the Bangladesh U-16 Women Football Team. Kazi Salahuddin and skipper of Bangladesh U-16 Women Football Team Maria Manda presented two footballs to the prime minister. Hosts Bangladesh emerged unbeaten Group F champions beating upper ranked Vietnam by 2-0 in the last match to seal a place in the second qualifying round of the AFC Women’s Under-16 Championship Qualifiers. The match took place at Bir Shrestha Shaheed Shipahi Mohammad Mostafa Kamal Stadium in Dhaka on September 23. Bangladesh got off to a winning start in the tournament as they dumped Bahrain by 10-0 goals in their group opening match and blanked Lebanon by 8-0 goals in their second group match.